Actually, how is Hundred Acre Wood so sunny all of the time? Despite a thick layer of trees, there’s always a healthy dose of sunshine. We often wonder how all the animals can stand it without a pair of sunglasses handy! The good news is that you can head to the Hundred Acre Wood, dressed as your favorite character, Winnie the Pooh, and you can do it all with a pair of shades. 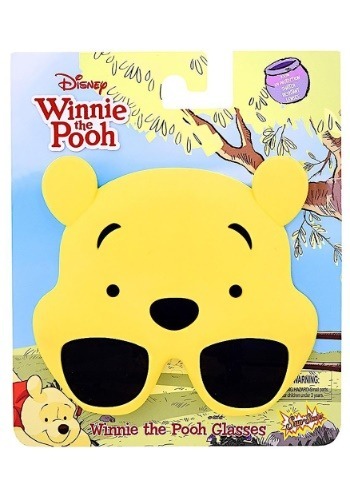 These Winnie the Pooh sunstaches help you protect your eyes from the sun, while also giving you a great way to cosplay as your favorite Pooh Bear. The fronts of the glasses are molded to look like Winnie the Pooh. The lenses even have UV protection, so you can confidently defy the rays of the sun as your child in hundred acre wood. Just slip these shades on and you’ll look like Winnie the Pooh! Even the sunny rays won’t get in the way of keeping chill like Pooh.